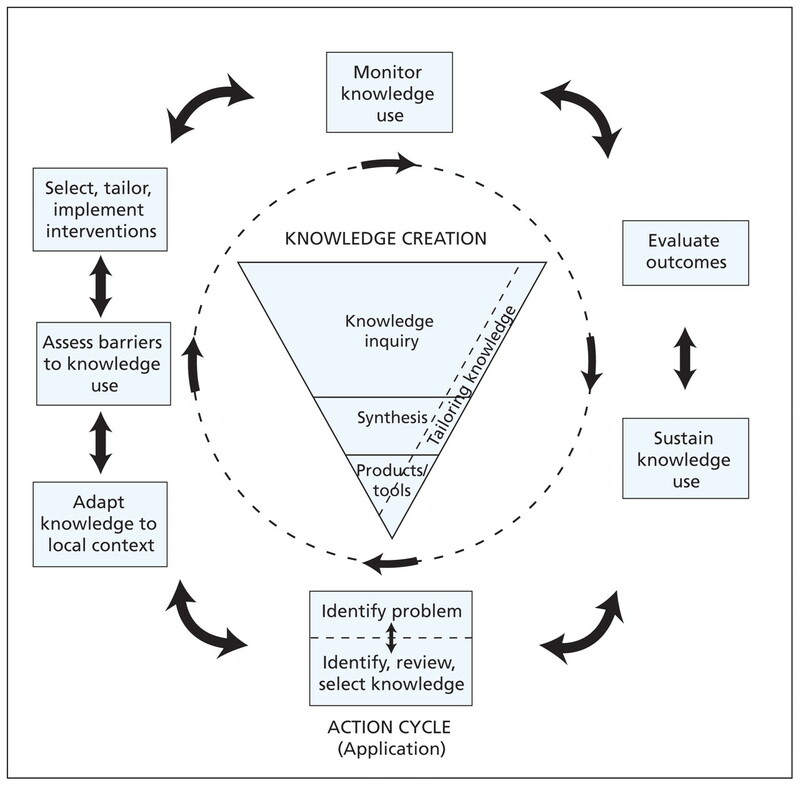 The knowledge-to-action cycle represents a framework for the implementation of knowledge. 1 As discussed in the first article in this series, the action phases of this cycle were derived from a review of 31 theories of planned action. 2 Included in this cycle (Figure 1) are the processes needed to implement knowledge in health care settings. In this paper, we address the adaptation of the knowledge to the local context and assessment of barriers to and facilitators of the use of knowledge. The action cycle is a dynamic and iterative process with each phase informing the others. Figure 1: The knowledge-to-action cycle. Why adapt guidelines for local use? Although guidelines provide evidence in a more usable form for clinicians than a plethora of primary studies, an important and additional necessary step is the adaptation of the guideline to the local context of use. National and international bodies have made major efforts to improve the quality and rigour of guidelines, 8,9 but less investment has been made in understanding how guidelines can be targeted to the local context of health care. By local, we mean a continuum of contexts that could range from a single clinic to a hospital, region or nation. Adaptation of existing high-quality guidelines for local use is an approach with the potential to reduce duplication of effort and enhance applicability. National guidelines often lack details on applicability and description of the changes in the organization of care required to apply the recommendations. 18 Adaptation of evidence may promote local uptake of evidence through a sense of ownership by the end-users who are engaged in this process. However, customizing a guideline to local conditions could weaken the integrity of the evidence base. We outline a systematic, participatory approach for evaluating and adapting available guidelines to a local context of use while maintaining the quality and validity of the guideline. Whether evidence is provided in the format of syntheses of knowledge, patient decision aids or clinical practice guidelines, end-users must consider if or how it could be adapted to the local context and the same principles can be applied to ensure these factors are considered before implementation of the evidence. To illustrate how to adapt guidelines, we will use a recent study that was performed to improve community care of individuals living with venous ulcers of the leg. 10,13 Regional managers of home care were concerned about costs of supplies, amount of nursing time, and frequency of visiting for clients with ulcers of the leg. A regional task force was developed to review existing practice guidelines to help guide the care plan. The task force identified that many of these guidelines were from international bodies and would require adaptation to the local context. How are guidelines adapted for local use? Existing guidelines can be evaluated and customized to fit local circumstances through an active, systematic and participatory process. This process must preserve the integrity of the evidence-based recommendations when differences in organizational, regional or cultural circumstances may legitimately require important variations in recommendations. 8,9,14–16,19 In adapting a guideline, consideration is given to local evidence, such as specific health questions relevant to a local context of use; to specific needs, priorities, legislation, policies and resources; to scopes of practice within the local health services; and to fit within existing models of delivery in the targeted setting. Adapting the guideline to this local evidence is assumed to improve uptake of the guidelines. Returning to our example involving care of ulcers of the leg, the task force collectively assessed the quality of individual guidelines and their recommendations. They developed a protocol that was feasible to implement locally and that was endorsed by stakeholders. The guideline was condensed to a one-page algorithm to enhance use by the clinicians, and documentation forms were created for collection of clinical data. For example, to streamline the process of assessment and facilitate application of evidence-based care, documentation forms were created to collect information about the cause of the ulcer, with venous symptoms and history on one side of the page and arterial symptoms on the other. Respect for and acknowledgement of guideline materials used as sources. What is the ADAPTE process? The ADAPTE process consists of three main phases, including planning and set-up, adaptation, and development of a final product (Box 1). The set-up phase outlines the necessary tasks to be completed before the process of adaptation, including identifying necessary skills and resources, and designing the panel. The panel should include relevant end-users of the guideline, such as clinicians, managers and patients. The phase of adaptation assists in moving from selection of a topic to identification of specific clinical questions; in searching for, retrieving and assessing guidelines; in decision-making around adaptation; and in preparing the draft version of the adapted guideline. 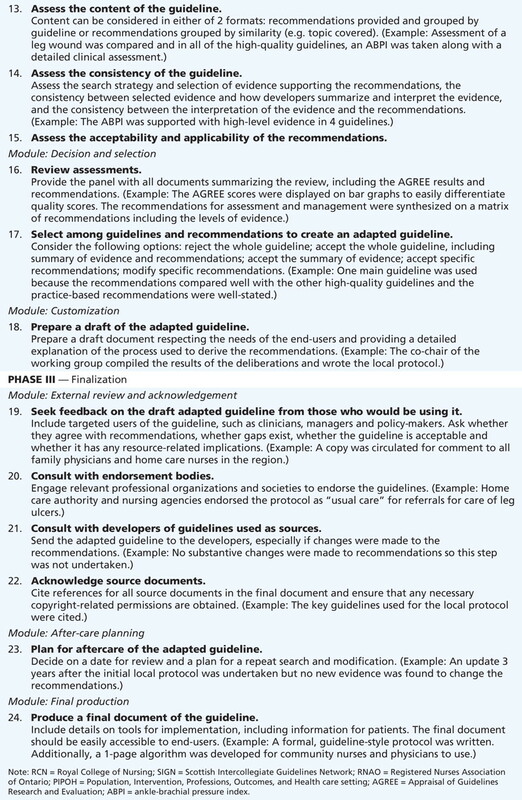 Assessment of the retrieved guidelines involves evaluation of their quality (i.e., using the AGREE [Appraisal of Guidelines Research and Evaluation] instrument 9,23), currency (i.e., how up-to-date they are) and consistency (i.e., congruence of the recommendation with the underlying evidence). Assessment also consists of the examination of the acceptability (i.e., to clinicians and patients) and applicability (i.e., feasibility of applying recommendations) of the guidelines’ recommendations within the proposed context of use. This evaluation provides an explicit basis for informed and transparent decision-making around the selection and modification of guidelines used as sources. This process can result in different alternatives ranging from adopting a guideline unchanged, to translation of language and adaptation of format, to modification and updating of single recommendations, to the production of a customized guideline based on various guidelines used as sources. The finalization phase includes external review, feedback from relevant stakeholders, and consultation with the developers of source guidelines. Establishing a process for updating the adapted guideline and writing the final document are the last stages. The ADAPTE process is supported by tools on the ADAPTE website, including a manual and toolkit. For each module, the manual provides a detailed description of the aims and tasks, the products and deliverables, and the skills and organizational requirements necessary to undertake the tasks. An example related to the adaptation of guidelines for screening for cervical cancer is provided throughout the modules. In the toolkit, 19 tools or instruments are offered to help structure the process and collect necessary information for decision-making. For example, tool number 2 offers a comprehensive search strategy to help in identifying existing guidelines by searching websites of sources of guidelines (e.g., guideline-related clearing-houses, known developers’ sites, specialty organizations) and MEDLINE. Tool number 6 helps a group convert the topic of the guideline into a set of clear and focused key questions before the process of adaptation. Tool number 15 proposes a series of structured questions and criteria to guide the assessment of and discussion on whether a recommendation of a guideline is applicable or acceptable in the planned context of use and to identify the organizational changes that may be needed to deliver the recommendation. Steps and tools are flexible and have been designed to allow for alteration in the sequence in which they are used to fit with users’ time or restraints in resources. Adapting a guideline or other tool of knowledge is a key component of the knowledge-to-action cycle. The adaptation process also integrates other steps of the cycle, including assessment of barriers to and facilitators of use of knowledge, which is necessary both for adapting and implementing the guideline. The use of a framework is important for assessing barriers because it helps researchers and practitioners identify research questions, generate testable hypotheses, assess outcomes using valid and reliable instruments and make valid inferences from their results. A framework would ensure that researchers can elaborate theory-based interventions that have the potential for increasingly effective implementation of knowledge into clinical practice. 24 More importantly, the use of a framework also provides the foundation for the tools that help busy clinicians implement practice guidelines. More recently, the Clinical Practice Guidelines Framework for Improvement was expanded. In a study targeting the identification of barriers to and facilitators of implementing shared decision-making in clinical practice, each type of barrier was provided with a specific definition. 28 The intention was to standardize the reporting of barriers to and facilitators of use of knowledge in the context of health care. 28 Barriers were defined as factors that would limit or restrict implementation of shared decision-making in clinical practice. 29 More importantly, the Clinical Practice Guidelines Framework for Improvement was transferred into a list of potential facilitators of use of knowledge in clinical practice. 28 Facilitators were defined as factors that would promote or help implement shared decision-making in clinical practice. Sometimes we forget that the same factor may sometimes be identified both as a barrier to and as a facilitator of use of knowledge, showing the importance of developing a more comprehensive and integrated understanding of both barriers and facilitators concurrently. 30,31 The Clinical Practice Guidelines Framework for Improvement was further extended to include the attributes of innovation as proposed by the Diffusion of Innovation theory. 32 As a result, except for the barrier known as lack of awareness (i.e., not knowing of the existence of a guideline) and the facilitator known as awareness (i.e., knowing about a guideline), the other factors initially proposed by the Clinical Practice Guidelines Framework for Improvement were potential barriers or facilitators. One new barrier, “forgetting” (i.e., inadvertently omitting to attend to something) was also identified. This revised version of the Clinical Practice Guidelines Framework for Improvement was used in a systematic review of barriers to and facilitators of implementing shared decision-making in clinical practice. 33 The framework was applied successfully in extracting data from 41 publications covering 38 unique studies. 33 The corresponding definitions of each of the potential barriers to and facilitators of use of knowledge in the health care context are provided in Appendix 1 (available at www.cmaj.ca/cgi/content/full/cmaj.081232/DC1). One of us (FL) completes regular audits of practice as part of a primary health care group. In a large, urban site for teaching family medicine (i.e., with 20 clinical teachers and 24 residents in family medicine as well as three nurses), the residents recently completed an audit of ambulatory care of patients with type 2 diabetes mellitus. One of the clinical teachers supervised a group of four residents in the completion of this audit. Residents reviewed the relevant practice guidelines and assessed their quality using the AGREE checklist. Based on this appraisal of quality, they retained the recommendations of the guidelines of the Canadian Diabetes Association. Based on these recommendations, they created a grid for extracting data on whether the recommendations were implemented. Forty patient charts were chosen randomly and the percentage of cases that followed the recommendations of guidelines was calculated. The results of the audit were presented to the health care team for discussion. For example, results showed that a test for glycosylated hemoglobin was performed every three months, as recommended by the guidelines of the Canadian Diabetes Association (i.e., level D, consensus) in only 30% of cases. Based on the Clinical Practice Guidelines Framework for Improvement, discussion by the group revealed that barriers perceived by health care providers included lack of agreement with the recommendation because it was too rigid or artificial, factors associated with environment such as not having enough staff to carry out the recommendation, lack of agreement with the applicability of this recommendation to the population served by the practice based on the characteristics of the patient because some patients had very stable results in the past, and external factors, such as perceived inability to reconcile patient preferences with compliance to this recommendation. This scenario shows that groups of providers in real clinical settings can take advantage of this checklist to identify barriers to carrying out recommendations in guidelines for practice. Once the barriers are made explicit, solutions can be expected to be brought forward for the benefit of patients. Without ignoring that one solution usually does not fit all, this checklist has the potential to help groups of providers reconcile their diverse perspectives because it is evidence-based, extensive and explicit. Although many current research-based initiatives focus on implementing guidelines and assessing factors influencing use of knowledge in health care practices, many challenges remain that will need to be addressed by rigorous research. First, evaluation of the ADAPTE process is needed to determine its impact on the implementation of guidelines. Second, validated methods are needed to assess barriers to and facilitators of the translation of research into clinical practice. 29,35,36 Researchers and clinicians may want to consider using existing models that have been tested, such as the Clinical Practice Guidelines Framework for Improvement (i.e., in its latest version), to conduct studies on barriers to and facilitators of assessment. 25 Lastly, more will need to be done to reconcile the recommendations of practice guidelines to the sharing of care-related decisions with patients — the core concept of patient-centred care. Clinical practice guidelines can be adapted to local circumstances and settings to avoid duplication of efforts and optimize use of resources. The ADAPTE process is an approach to adapting guidelines to local contexts through the explicit participation of relevant decision-makers. Assessing barriers to and facilitators of the use of knowledge is closely linked to the adaptation and uptake of the evidence. Straus SE, Tetroe J, Graham I. Defining knowledge translation. CMAJ 2009;181:165–8. Contributors: Margaret Harrison, Béatrice Fervers and Ian Graham, who are founding members of the ADAPTE group, were involved in the development of the methodology of the manuscript, and conceptualized and drafted the section on adaptation of guidelines. France Légaré and Ian Graham were involved in the conceptualization and drafting of the section on assessment of barriers. All of the authors critically revised the manuscript and approved the final version submitted for publication. Funding: No external funding was received for this paper. The book Knowledge Translation in Health Care: Moving from Evidence to Practice, edited by Sharon Straus, Jacqueline Tetroe and Ian D. Graham and published by Wiley-Blackwell in 2009, includes the topics addressed in this series. Graham ID, Logan J, Harrison MB, et al. Lost in knowledge translation: time for a map?J Contin Educ Health Prof 2006;26:13–24. Straus S, Haynes RB. Managing evidence-based knowledge: the need for reliable, relevant and readable resources. CMAJ 2009;180:942–5. Straus SE, Richardson WS, Glasziou P, et al. Evidence based medicine: how to practice and teach it. Edinburgh (UK): Elsevier; 2005. p. 95–7. Burgers JS, Grol R, Zaat JO, et al. Characteristics of effective clinical guidelines for general practice. Br J Gen Pract 2003;53:15–9. National Institute for Health and Clinical Excellence. Available: www.nice.org.uk (accessed 2009 Sept. 15). Grimshaw JM, Thomas RE, MacLennan G, et al. Effectiveness and efficiency of guideline dissemination and implementation strategies. Health Technol Assess 2004;8:iii–iv, 1–72. Toman C, Harrison MB, Logan J. Clinical practice guidelines: necessary but not sufficient for evidence-based patient education and counseling. Patient Educ Couns 2001;42:279–87. Harrison MB, Graham ID, Lorimer K, et al. Leg-ulcer care in the community, before and after implementation of an evidence-based service. CMAJ 2005;172:1447–52. Ray-Coquard I, Philip T, Lehmann M, et al. Impact of a clinical guidelines program for breast and colon cancer in a French cancer centre. JAMA 1997;278:1591–5. Ray-Coquard I, Philip T, de Laroche G, et al. A controlled “before-after” study: impact of a clinical guidelines programme and regional cancer network organization on medical practice. Br J Cancer 2002;86:313–21. Harrison MB, Graham ID, Lorimer K, et al. Nurse clinic versus home delivery of evidence-based community leg ulcer care: a randomized health services trial. BMC Health Serv Res 2008;8:243. Fretheim A, Schunemann HJ, Oxman AD. Improving the use of research evidence in guideline development: 3. Group composition and consultation process. Health Res Policy Syst 2006;4:15. Graham ID, Harrison MB, Brouwers M, et al. Facilitating the use of evidence in practice: evaluating and adapting clinical practice guidelines for local use by health care organizations. J Obstet Gynecol Neonatal Nurs 2002;31:599–611. Graham ID, Harrison MB, Brouwers M. Evaluating and adapting practice guidelines for local use: a conceptual framework. In: Pickering S, Thompson J, editors. Clinical governance in practice. London (UK): Harcourt; 2003. p. 213–29. Graham ID, Harrison MB, Lorimer K, et al. Adapting national and international leg ulcer practice guidelines for local use: the Ontario Leg Ulcer Community Care Protocol. Adv Skin Wound Care 2005;18:307–18. Burgers JS, Cluzeau FA, Hanna SE, et al. Characteristics of high-quality guidelines: evaluation of 86 clinical guidelines developed in ten European countries and Canada. Int J Technol Assess Health Care 2003;19:148–57. Fervers B, Burgers JS, Haugh M, et al. Adaptation of clinical guidelines: literature review and proposition for a framework and procedure. Int J Qual Health Care 2006;18:167–76. Shiffman RN, Shekelle P, Overhage JM, et al. 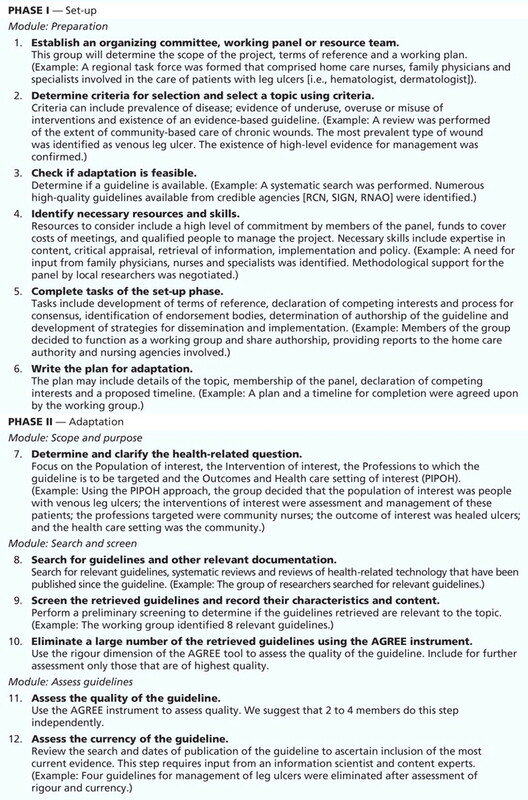 Standardized reporting of clinical practice guidelines: a proposal from the Conference on Guideline Standardization. Ann Intern Med 2003;139:493–8. Verkerk K, Van Veenendaal H, Severens JL, et al. Considered judgement in evidence-based guideline development. Int J Qual Health Care 2006;18:365–9. Grol R, Dalhuijsen J, Thomas S, et al. Attributes of clinical guidelines that influence use of guidelines in general practice: observational study. BMJ 1998;317:858–61. AGREE Collaboration. International assessment of quality clinical practice guidelines in oncology using the Appraisal of Guidelines and Research and Evaluation instrument. J Clin Oncol 2004;22:2000–7. Eccles M, Grimshaw J, Walker A, et al. Changing the behavior of healthcare professionals: the use of theory in promoting the uptake of research findings. J Clin Epidemiol 2005;58:107–12. Ajzen I. Attitudes, personality and behavior: Berkshire (UK): Open University Press; 1988. Espeland A, Baerheim A. Factors affecting general practitioners’ decisions about plain radiography for back pain: implications for classification of guideline barriers — a qualitative study. BMC Health Serv Res 2003;3:8. Légaré F, O’Connor AM, Graham ID, et al. Primary health care professionals’ views on barriers and facilitators to the implementation of the Ottawa Decision Support Framework in practice. Patient Educ Couns 2006;63:380–90. Graham ID, Logan J, O’Connor A, et al. A qualitative study of physicians’ perceptions of three decision aids. Patient Educ Couns 2003;50:279–83. Kennedy T, Regehr G, Rosenfield J, et al. Exploring the gap between knowledge and behavior: a qualitative study of clinician action following an educational intervention. Acad Med 2004;79:386–93. Rogers EM. Diffusion of innovations. 4th ed. New York (NY): The Free Press; 1995. Légaré F, Ratte S, Gravel K, et al. Barriers and facilitators to implementing shared decision-making in clinical practice: update of a systematic review of health professionals’ perceptions. Patient Educ Couns 2008;73:526–35. Larson E. A tool to assess barriers to adherence to hand hygiene guideline. Am J Infect Control 2004;32:48–51. Saillour-Glenisson F, Michel P. Individual and collective facilitators and barriers to the use of clinical guidelines by physicians: a literature review [article in French]. Revue Épidémiologique de Santé Publique. 2003;51:65–80.